Luck in poker comes in many forms. Most of us think of luck when we get devastated by a 2 outted player or hammered by the guy who caught the river chasing a runner, runner draw. However, getting lucky in poker is a two way street. Sometimes it is against you, sometimes, its with you. Either way, it effects the outcome of the game. Handling luck and fluctuation well is a standard characteristic of a winning poker player. Luck is indeed a huge factor which changes “winning poker” into a long term goal rather than a short term dream. One huge way you can battle against the role of luck in poker is to basically prey on weak players. 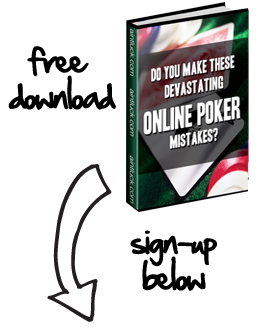 The impact of luck on Poker is directly proportional to the variance of the skill of the players. What this means is that if 2 players have equal skill then the outcome of a session of poker is more likely to be determined by the “luck of the cards” as opposed to players having unequal skill where luck will have less impact. If you play players that are of similar skill as you, you will notice that the cards will almost always determine who will win the session. You can refer to our strategy article on proper bankroll management to learn more about its correllation with luck in poker. Basically, luck and fluctuation are a part of the game and you need to prepare your bankroll to take those consistent hits. The blinds you stole when you knew you could. The well timed bluffs against the right player at the right time. The few extra dollars you sucked out of your opponent when you bet the right amount. Chasing your draw when the pot odds were favorable every time. The time you folded the best hand when you knew 2 opponents had great draws that would devastate your hand.